Just to underline what is said here, 60 percent of the policemen who got even the very minimal training on offer to them have disappeared from the force; and not much is left of the weaponry (“equipment”) that the US gave the Iraqi police. The report also has two graphics that should make us very suspicious about all the declarations that the troop escalation or ‘surge’ has significantly reduced violence in Iraq. I cut the graphs in half, so they show only 2006 and 2007 and relabled them, but you can scroll down at the pdf link above to see the originals. I did not modify them in any other way. The first graph shows average daily casualties (dead and wounded badly enough to go to hospital) by month in Iraq. This graph shows that there was no significant reduction in daily casualties in Iraq this summer. 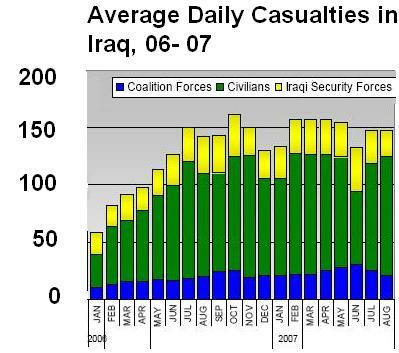 June saw a dip, mainly in civilian Iraqi casualties; coalition and Iraqi security force casualties were as bad as ever. Since the reduction in civilian casualties was not sustained, it is not significant, and could just have been a fluke (a few car bombs in markets failed to kill as many people as usual, e.g.) Somewhere around 150 persons continued to be killed or wounded every single day according to this chart, with a very minor daily reduction in the hot months of the summer when it is harder to fight. The second graph gives the number of attacks per month. Obviously, a lot of attacks produce no casualties. Mortars land uselessly in the desert, e.g. 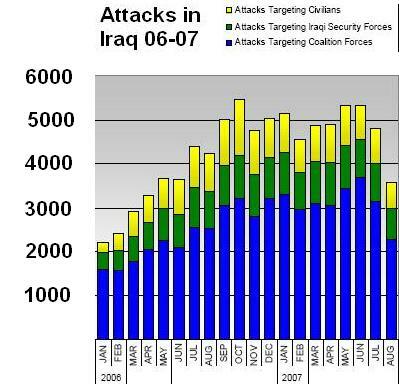 This graph shows that with regard to attacks May and June (when the ‘surge’ was well under way) were two of the most violent months ever since the US occupation of Iraq began. 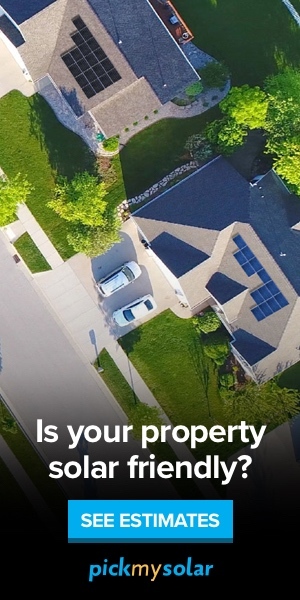 The June average was 177.8, the highest ever seen. July was more like the violent fall-winter 2006 than it was like the slightly less violent summer. The Pentagon is trying to give us the impression that August was a ‘trend’, but statistically that is silly, since it was just one month and what came before it was pretty horrible. The dip in attacks in August does not seem to have come with much of a dip in casualties, in any case. And if all that is happening is that fewer US troops are being attacked, but similar numbers are being wounded or killed, I’m not sure that is even significant. Since some of the attacks were on the British in the south, changes in the way they were deployed could have had a small impact on these statistics. The Pentagon tells us that violence in Baghdad is back down to the levels of summer, 2006. But whether that is true or not, the generalization cannot be made for Iraq, by the Pentagon’s own statistics. If you do a three-month rolling average for months prior to September, whether you look at numbers of attacks or numbers of casualties, there has not been a significant improvement with regard to violence in the country as a whole.